Mmmmm hot wings! I am sure there is a song that mentions hot wings that my daughter is always watching on cable but I digress before I have even begun haha. Actually the only way I can even get the kids attention these days is to produce a couple of trays of something like these chicken wings. The most important thing you need to know about this recipe for yummy hot wings is that you must dry your wings before covering them in flour. 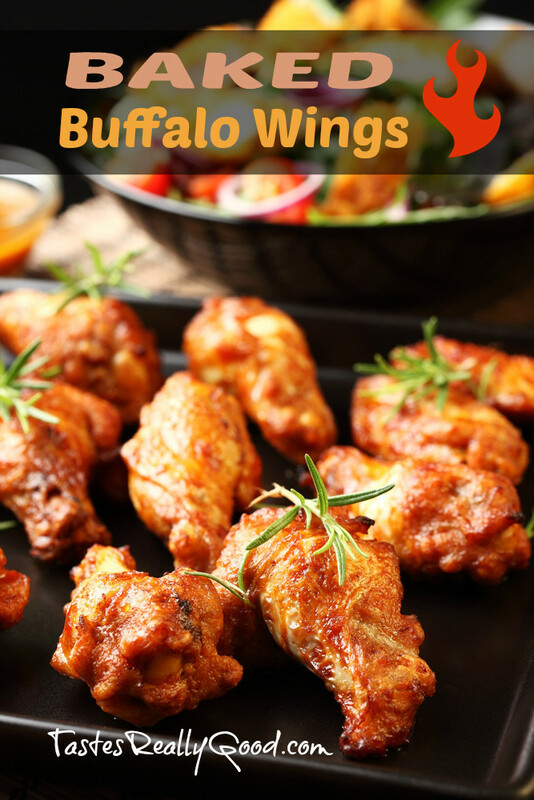 This will stop your wings from becoming soggy. You also must refrigerate your chicken wings for at least an hour. I cant emphasize these two things enough. In addition to this my mother recently suggested I line my pan with aluminium foil and then place my wings on a rack and let them drip down into the pan so they are not being cooked soaking in grease. Thanks mom this is a good time saver and a healthier too. A lot of people don’t know you can make crispy hot wings without frying. Well now you do. Ok without getting too big a head you can see how beautiful my baked buffalo wings turned out so don’t tease your tummy any longer! Place the flour, cayenne pepper, garlic powder, and salt into a resealable plastic bag, and shake to mix. Place the wings onto the prepared baking sheet, and place into the refrigerator. Refrigerate at least 1 hour. Whisk together the melted butter and hot sauce in a small bowl.